First thing’s first. I want to apologize for the lateness of this post. We’ve been packed up for the season for sometime now, and knowing this was going to be the final post of the year, I wanted to put a positive spin on it. 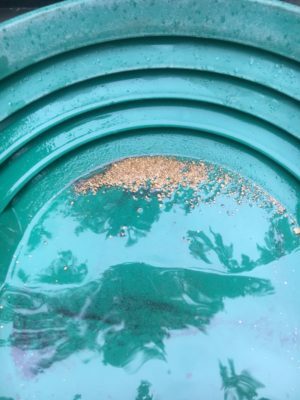 I wanted something other than “well that sucked, and now its over.” I wanted to tell you guys that we did eventually find the source of the great gold we were getting at the bottom of the cliff face, and show you photos of the sluice box and pans just piled with gold. I scrabbled and mucked like a slave. I hurled my youth into a grave. And somehow the gold isn’t all. I realized that this IS part of gold mining, and you guys would understand. It’s not the GOLD that matters, it’s the STORY that does. So here it goes. Well that sucked, and now it’s over. We continued to search for the source of the gold we’d found. We studied maps, built roads, and dug test holes. 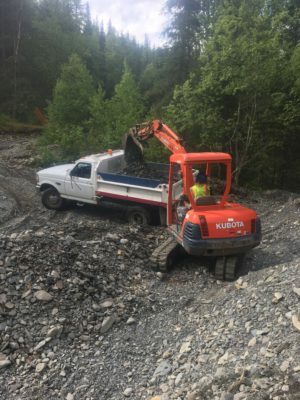 The rain that plagued us almost this entire season doubled down for the end of the summer, and we found ourselves spending most of our time getting stuck, getting unstuck, or repairing roads. It gets worse. The next day, guess who came to visit? Why, the friendly neighborhood MSHA inspector (mining safety and health administration), and this is what he saw. For those of you that aren’t miners, you don’t know the fear that these four letters strike in the hearts of small miners. While MSHA’s purpose is valid and honorable, mining safety laws are written for multi-million dollar operations, are up to the interpretation of the inspector, and are very subjective and difficult to understand. As a small operator, compliance is almost impossible. We lucked out. We got an inspector who was a pretty decent fellow; no tickets, but a laundry list of things to fix. It was maybe a week later, my husband and I in the woods, in the rain, using a come-along and a tree to try to get the track back on the excavator, that’s when I knew we were done. We had run out of steam, and it was time to call it for the season. I don’t know what next season holds, we are too exhausted right now to make any plans. While we settle in for the long winter, I’ll leave you with the last passage of that same poem. Until next season! God Bless. So much as just finding the gold. This entry was posted in 2017, Uncategorized and tagged alaska, gold, Gold Mining, MSHA, Paydirt, Quartz creek, Trommel on October 27, 2017 by terest test. In the last post I explained that while our new spot ended up having spectacular gold, but we soon learned that we were only getting material brought down by small springs over the top of a bedrock cliff. For the last few weeks we’ve been working on finding the source of that gold on the ridge up above. 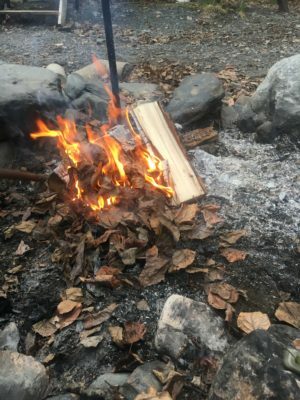 In the National Forest, we’re not allowed to simply blaze new trails whenever we feel like it. 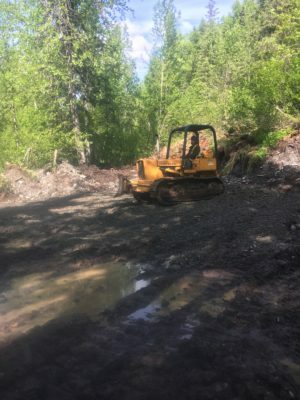 We have to work our way through the forest, with as little damage as possible, dig test holes, then go back and apply for permits to build more trail. Sounds simple enough? Its not. The forest is thick here, so thick you cant even really see what lies ahead of you until you get right up on it. But we have been trying. 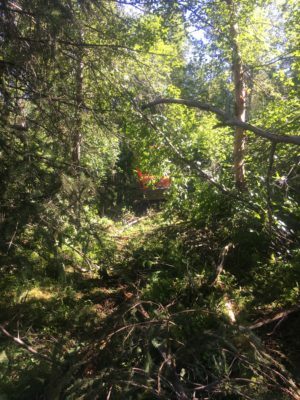 We spent part of a day stuck on a tree where the excavator slid sideways and pinned the tree between the track and blade. 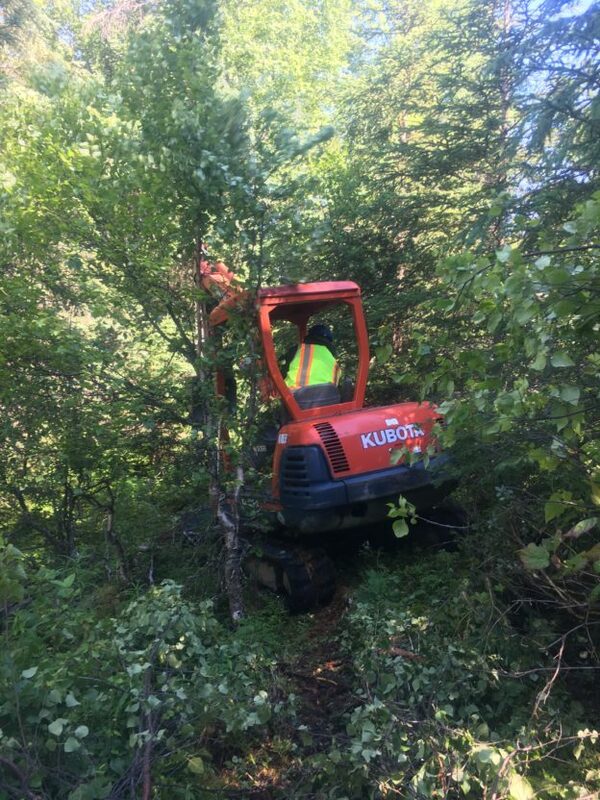 We couldn’t cut the tree, we had to winch the excavator off by hand. With the wash plant sitting idle, we have been digging holes, getting bucket samples, fill the hole in, and rinse-repeat. Tedious and frustrating. The crew’s morale has been low. We even spent part of a day sneaking into our old dig site and running some of that dirt, just so we could remember what gold looks like. I’m sure you are wondering, if there is still gold there, why are we spending time digging test holes? It’s because we are almost out of paydirt in that spot, we need to identify a new dig site if we are going to continue mining, and we only have one summer to do it. We can’t do both. 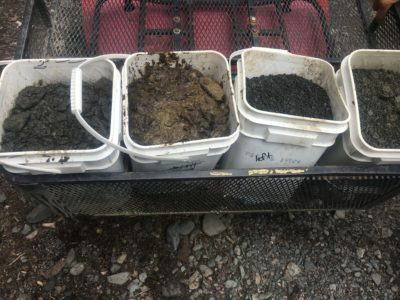 What makes matters worse is just digging a bucket sample isn’t enough. We’re digging into ancient river benches, just because you dig one hole, doesn’t mean you’ve found the correct spot in the river channel. 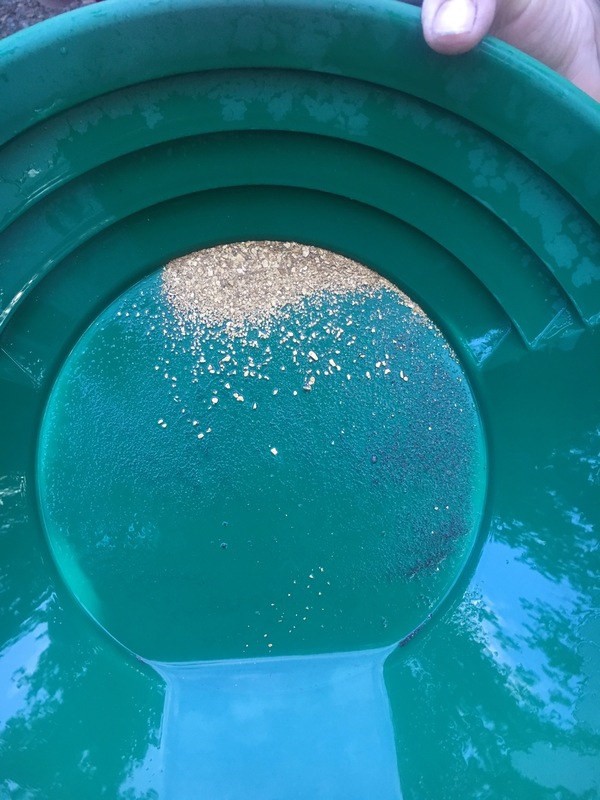 You could be digging in the wrong side of a curve, or where the water was too fast to collect gold, or miss the channel completely by a few feet. We’ve found a spot that we do have access to where the gravel looks good. Its 100 feet away from the hot spot identified on the magnetometer survey, but we thought it was worth running a few yards through the trommel to see what happens when we get into the bench. The returns so far have been disappointing, but seem to be improving as we get further into the formation. Summer is waning, the kid will have to go back to school soon, but all we can do is keep trying. Gold is where you find it after all. 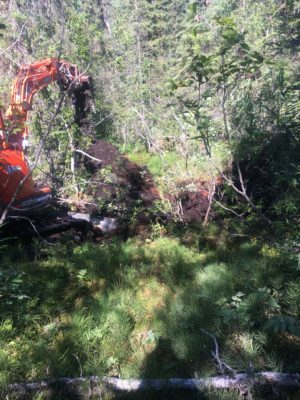 This entry was posted in 2017, Uncategorized and tagged Adventure, alaska, family, gold, Gold Mining, pay dirt, Paydirt, placer mining, Sample, Trommel on August 3, 2017 by terest test. Last time, I kind of left you all wondering what kind of gold we were getting at our new spot. 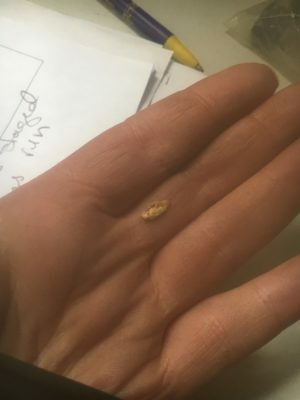 Let me share with you what happened, and it’s nothing like I was expecting when I wrote the last post. We started digging into the bottom of the hill at the new spot. Once we got the mudslide problem handled, we were able to start processing the material. The returns were good. Really, really good. The gold was bigger, and there was more of it. We calculated the yield at more than 50 dollars a yard. For those of you not in the mining business, to put this into perspective, consider that most commercial operations look material at least 15 dollars a yard to be considered profitable. We were on top of the world, after 7 years, it looked like we had finally found what we had been searching for. We bought an excavator. We started filling in our old dig. Unfortunately, it wasn’t long until we hit a wall, both literally and figuratively. As we dug into the hill, we started to expose rotten slate bedrock. This is not always a bad thing, sometimes the gold will work it’s way down into the cracks of the rock. We even found a quartz vein in the wall; when we crushed the pieces and panned them there was gold in the pan. However, more dirt we ran, the bigger that wall got in front of us, and the worse our cleanouts got worse. The wall was now taller than the reach of the excavator. 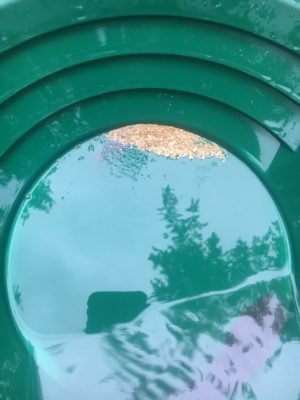 We stopped and spent a day testing buckets all the types of material we were seeing to try to see where the gold was coming from. The tests showed that the gold was coming from the dirt on the top of the wall. Our returns were good because we were digging in the stuff that had sloughed off from the top. Somehow, we had to get on top of it. If I haven’t described the new spot to you, its a steep valley where multiple little springs run down from the top of the canyon wall. These springs bring down tons of soil and rotten vegetation, and it’s sopping wet. 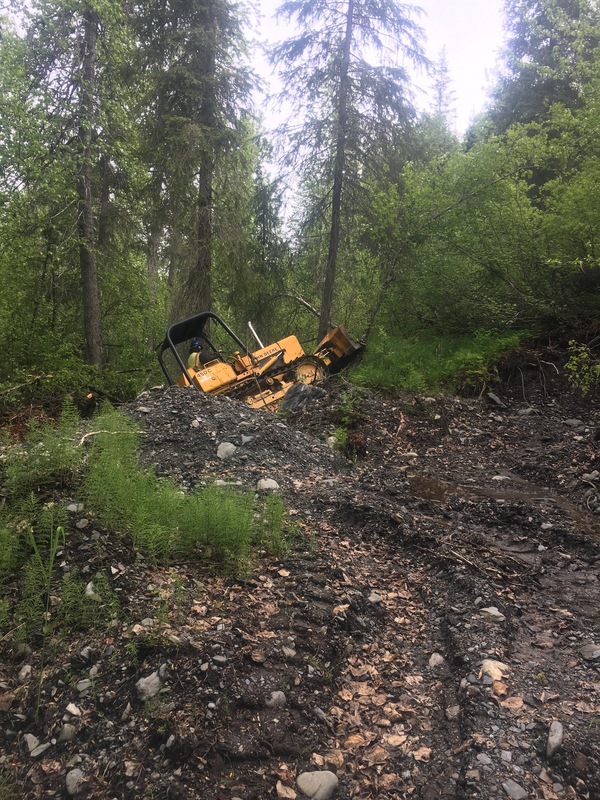 We spent a day trying to work our way up the hill, it only resulted in us pulling the track off the excavator and spending the rest of the day trying to put it back on in the mud. We considered building some sort of ramp, but it would take weeks to haul the material to build it, and it would extend almost to the river. Once we got up there, there would still be no way to maneuver. I wish I could tell you that we figured it out, but we haven’t yet. We DO know that there is probably only one way to do it. We have to go back down the trail about a 1/4 mile and try to work our way up to the top of the valley through the woods. 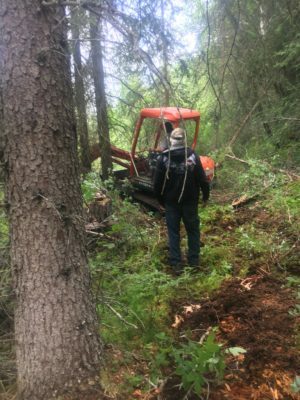 In the National Forest, we are not simply allowed to drop the blade on the dozer and create trails wherever we need them. It takes permits, time, and money to get approval for that kind of thing. We will have to weave our way through the trees as we are not approved to cut them. If you’ve never walked through the forest in Alaska, you might not know that very rarely do you find that you can easily walk through the forest, there is usually a pretty thick underbrush. if its hard to walk, imagine what it’s like to drive a tractor. I’m home with internet to write you this because we had to make a trip back to town to get the new excavator welded. 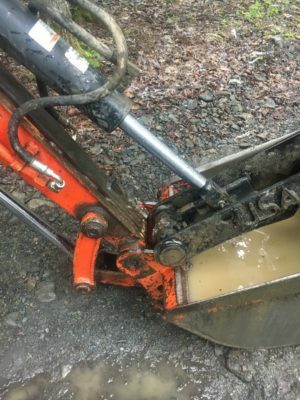 The thumb on the excavator broke off along an old weld and it was more than we could fix in the field. The plan is to attempt to get to the top this week, do some testing to see if we can find the source of that good gold, and then if we find it try to figure out how to get it down for processing. I wish I could leave you with my usual optimism, but it’s hard to find right now. We know there’s gold there, we are just not sure we are going to be able to reach it. It’s starting to get dark in the evenings, its almost the end of July, and there’s no going back to our old spot at this point. Incredibly frustrating, but that’s gold mining for you. 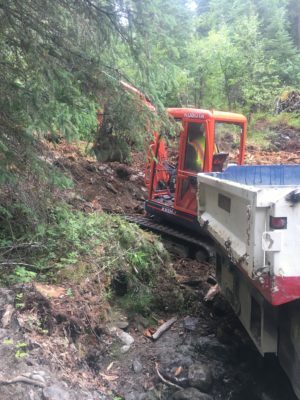 This entry was posted in Uncategorized and tagged alaska, benches, excavator, family, gold, Gold Mining, National Forest on July 20, 2017 by terest test. Meanwhile, back at the mine. Things have been going pretty good. Trommel has been running great, new water pump has allowed us to speed up processing. However, looking at our current dig site we started to realize at this rate we were going to run out of material to run in short order. We decided to start working on developing our new dig site. It’s scary to abandon a site where the gold returns are reliable and move to untested ground. While the magnetometer survey we had last year tells us there’s a good indication of gold, it’s not a guarantee. We won’t really know until we start processing. First step, we had to remove a few trees. Drag them down to camp, cut them up for firewood, or save them for our dear friends the wood turners to turn into works of art. We’ve been having very unusual weather lately, thunder and hail. Fire crews have been out looking for lightening caused ignitions. We even had a fire crew come into our camp fully armed and ready. They were relieved to find it was just our campfire smoke they had been tracking. The rain and the natural drainage at out new site ended up causing some problems for us. It wasn’t long until the area turned into a soupy mess. Mud to the top of the tracks on the dozer. 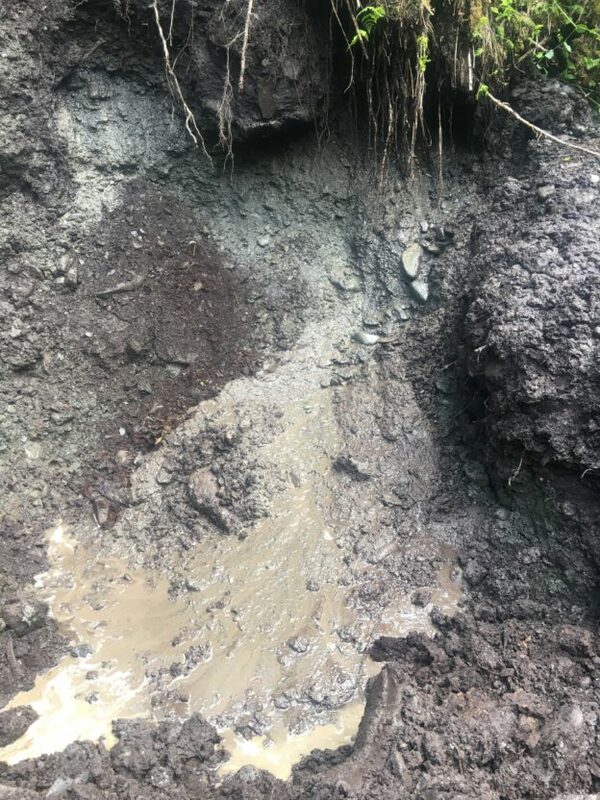 Digging into the bank, water started pouring out and causing a mud slide. It was the stuff that would have made great reality television. Me hollering at my husband on the excavator as huge rocks and mud start falling toward him. Him furoiusly trying to free the tracks from the mud so he can move out of the path of the slide. While it may have been exciting for the viewer, it was not that fun to experience, we knew we had to step back and find a safer way to do things. As we all learned in Sunday School, “the wise man builds his house upon the rock” and that’s something we DO have in abundance. Rocks. We are hoping that a good platform to work from will allow the hill to drain and also allow us to dig from a safe distance should things start sliding. We’re going to let it dry out for a few days and try again. I’ll keep you posted. 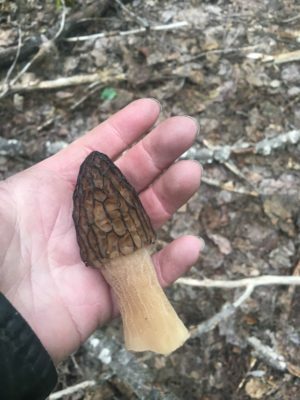 One good thing about the rain is that the forest has provided us with another treasure. A great addition to steak night! 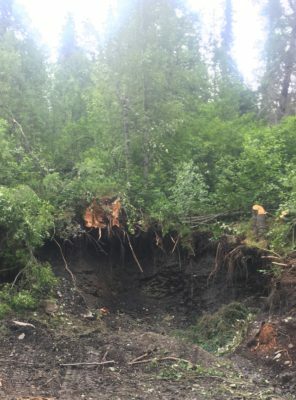 This entry was posted in 2017, Uncategorized and tagged alaska, family, gold, mining, morel, mud, thunder on June 19, 2017 by terest test. These were my husband’s words to me when he noticed the color drain from my face as 14 thousand pounds of bulldozer came slamming down on the tilt trailer. He was teasing, but he’s not wrong. I absolutely love the spring. I love dreaming about what we might accomplish this year at the mine. I love seeing the first leaves come out on the trees. I love seeing how the river has changed. I don’t particularly enjoy hauling all our equipment down winding mountain roads 70 miles from our home. 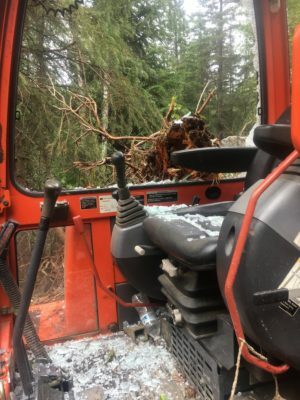 The price of getting to mine in the National Forest is that everything has to be removed at the end of the season, and staged again in the spring. So we pay that price. There’s nothing like when that first water comes down the sluice box. That’s when, in my mind anyway, it’s really mining season. We got the water going, the only thing left to do was run some dirt. We had our friend the welder make some plumbing changes to the trommel, and it seems like it’s really going to make a huge increase in our production. The trommel processed the material as fast as I could feed it. I never once had to use my trusty 2×4 to push a rock through the hopper, or get off the excavator to undo a jam. We decided to call it for the evening. We enjoyed the first campfire of the year. The next morning, we loose the pump seal, and everything stops. I don’t care how big your mining operation is, how shiny and new your equipment, it can still come to a grinding halt over something as simple as an o-ring. And so it did. 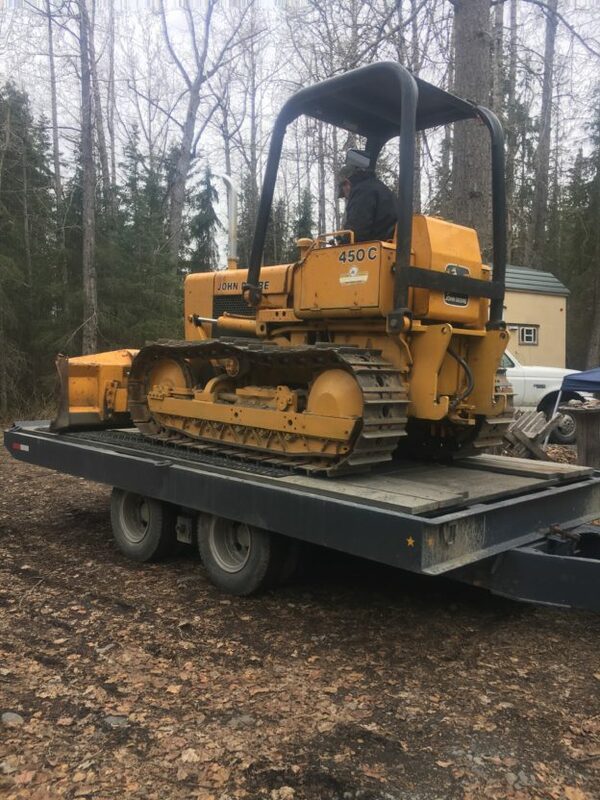 This entry was posted in 2017 and tagged alaska, dozer, family, gold, Gold Mining, husband, nugget, placer, pump, Trommel on May 23, 2017 by terest test.